The political action committee run by the parent company of Arizona’s largest monopoly utility, Arizona Public Service, rewarded Arizona legislators that backed its effort to stop a renewable energy ballot initiative with campaign contributions, according to campaign finance disclosures filed on July 10. The Pinnacle West PAC gave nearly $60,000 to state legislators who have voted in concert with APS’ efforts to kneecap a renewable energy ballot initiative that would require the utility to source 50% of its electricity from renewable energy by 2030. The current requirement is 15% renewable energy by 2025. Arizona’s Secretary of State, Michele Reagan, also received $2,500 this quarter from the Pinnacle West PAC, and has received $6,000 from the PAC so far this election cycle. The Secretary of State’s office is responsible for certifying the signatures needed to put the renewable energy initiative on the ballot this November. The Pinnacle West PAC also contributed $10,000 this quarter to candidates running for local offices far down-ballot, including city council, mayor, and even Justice of the Peace and Clerk of the Superior Clerk. The rest of the Pinnacle West PAC’s donations went to candidates for federal office, including $5,000 for Debbie Lesko, who won the seat for Arizona’s 8th Congressional District. Lesko is a longtime APS ally. In total, the PAC contributed $161,000 during the two-month filing period. It has given $860,000 this election cycle. Ninety-three percent of the money that Pinnacle West’s PAC spent on state legislators this quarter went to Republicans. Pinnacle West spent a total of $54,100 on Republican legislators, and just $4,000 on Democratic legislators in the second quarter of 2018 that the filing covered, from April 29 to June 30. A few months before receiving $2,000 from the Pinnacle West PAC, Republican Sen. Vince Leach introduced APS-backed legislation which would limit financial penalties for utilities who fail to meet renewable energy standards. APS acknowledged writing the legislation with Leach. The bill passed on party lines with unanimous Republican support in both chambers. 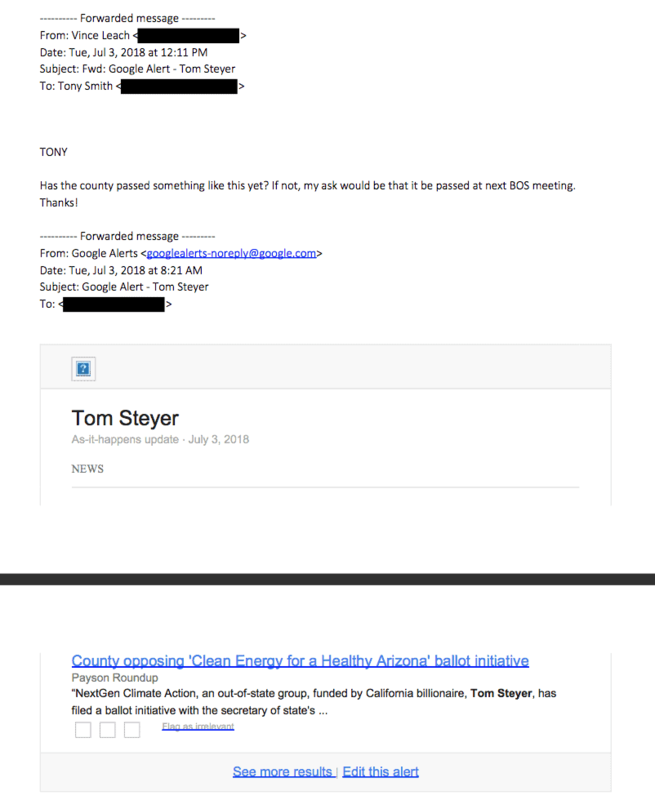 Leach also asked Pinal County Supervisor Anthony Smith for that county to pass a resolution against the renewable energy ballot initiative, according to records produced by Pinal County in response to a public records request filed by the Energy and Policy Institute. AZ Sen. Vince Leach asks Pinal County to pass a resolution against the “Clean Energy for a Healthy Arizona” renewable energy ballot initiative. Republican Sen. John Kavanagh joined Leach in receiving $2,000 from the Pinnacle West PAC on June 4. A few months before this payment, Kavanagh sponsored a rival ballot initiative to compete with the Clean Energy for a Healthy Arizona ballot initiative, which critics called an effort to confuse voters. That effort did not make it out of the legislature. Earlier this year, Kavanagh and Leach also both received money from Veridus, a PR firm and lobbying firm that has lead APS’ campaign against this November’s ballot initiative. Veridus is at the center of the recent conflict of interest scandal that resulted in the resignation of Ted Vogt as the Executive Director of the Arizona Corporation Commission (ACC). The only two Democrats that the Pinnacle West PAC supported with contributions were Sen. Robert Meza and Rep. César Chávez. While Meza and Chávez did not cross party lines to vote for Leach or Kavanagh’s bills, they did co-author an op-ed against the ballot initiative three months before receiving their $2,000 apiece. APS is Meza’s top career donor, and he has received thousands of dollars of personal income for his work with several groups that are also funded by APS throughout his career. Sen. Sonny Borrelli worked with Leach to introduce the legislation that would render the new renewable energy standard toothless if passed. Borrelli also received $2,000 from the Pinnacle West PAC. Republican Reps. J.D. Mesnard and T.J. Shope also received $2,000 and $1,000 from the PAC this quarter, respectively. Both representatives have vocally attacked the ballot initiative on social media. Its contributions to candidates running for local office focused on the cities of Chandler, Fountain Hills, Glendale, Mesa, Scottsdale, Surprise, Tempe and Youngtown. The second quarter financial filings from the Pinnacle West PAC come during a year with high stakes for Arizona’s energy future. Clean Energy for a Healthy Arizona recently turned in over 480,000 signatures in its effort to put the renewable energy initiative on the ballot this November. Commissioner Andy Tobin also recently released draft rules for his Energy Modernization Plan. The two Arizona Corporation Commission seats held by Tom Forese and Justin Olson are up for election this November. The last date to file remaining financial disclosures is July 16th, by which time APS’ independent expenditure campaigns, Arizonans for Affordable Electricity and Arizonans for Sustainable Energy Policy, will also have to make public their contributions and expenditures. Correction: An earlier edition of this post incorrectly identified Arizona Supreme Court Justice Clint Bolick as having received a contribution from the Pinnacle West PAC. The Arizona Supreme Court is not an elective office. The contribution in question was for Shawnna Bolick, a Republican candidate for the legislature who is married to Justice Bolick. EPI apologizes and regrets the error. Charlotte is the Research and Communications Manager at the Energy and Policy Institute. Prior to EPI, she was the staff economist for three years at Oceana, where she provided economic analysis for marine habitat and fisheries policy and mentored staff on campaign strategies. She has published work in newspapers, academic journals and technical reports. Charlotte earned a Master’s in Ecological Economics from the University of Edinburgh and a B.A. in International Affairs from The George Washington University.